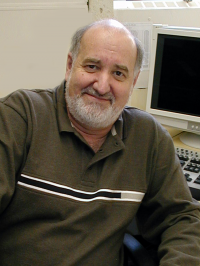 Dr. Grigliatti is a researcher in the area of cell and developmental biology. In addition to his role as a Principal Investigator at ICORD, Dr. Grigliatti is a Professor in the Life Sciences Institute at the University of British Columbia, and an Associate Member of the Department of Medical Genetics at the University of British Columbia. He completed his B.Sc. at Santa Clara University. His M.S. was obtained from California State University, and his Ph.D. was at the University of British Columbia. Dr. Grigliatti has collaborated with Dr. Wolfram Tetzlaff, Dr. Jens Coorssen, and other members of the ICORD team to identify biomarkers which indicate the severity of SCI. Please contact Dr. Grigliatti with inquiries. Lubieniecka, JM et al.. 2013. A discovery study of daunorubicin induced cardiotoxicity in a sample of acute myeloid leukemia patients prioritizes P450 oxidoreductase polymorphisms as a potential risk factor.. Front Genet. doi: 10.3389/fgene.2013.00231. Bains, OS et al.. 2013. A correlation between cytotoxicity and reductase-mediated metabolism in cell lines treated with doxorubicin and daunorubicin.. J. Pharmacol. Exp. Ther. doi: 10.1124/jpet.113.206805. Lubieniecka, JM et al.. 2013. Single-nucleotide polymorphisms in reductase genes are not associated with response to daunorubicin-based remission induction.. Cancer Epidemiol. Biomarkers Prev. doi: 10.1158/1055-9965.EPI-13-0671. Lubieniecka, JM et al.. 2012. Single-nucleotide polymorphisms in aldo-keto and carbonyl reductase genes are not associated with acute cardiotoxicity after daunorubicin chemotherapy.. Cancer Epidemiol. Biomarkers Prev. doi: 10.1158/1055-9965.EPI-12-1037. Adomat, HH et al.. 2012. Validation of a sequential extraction and liquid chromatography-tandem mass spectrometric method for determination of dihydrotestosterone, androstanediol and androstanediol-glucuronide in prostate tissues.. J. Chromatogr. B Analyt. Technol. Biomed. Life Sci. doi: 10.1016/j.jchromb.2012.06.031.